Direct-fired air handlers are an efficient piece of equipment to deliver fresh, clean air into a manufacturing space or paint booth area. 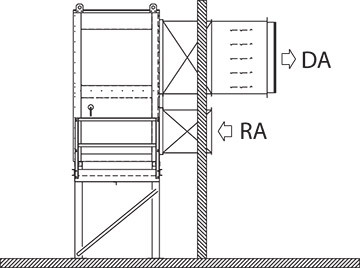 Air handlers require minimal ductwork and can be installed indoors or outdoors, horizontally or vertically. 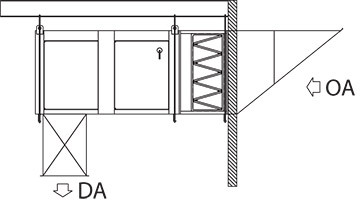 Air can be filtered (inlet hood and/or filter section) before entering the space. In warmer weather, burner can be turned off to provide free ventilation cooling. Heaters deliver 100% combustion efficiency with assistance of 30:1 modulating burner. Heavy-duty, robust frame provides unit stability to accept exterior galvanized panels. Panels are attached via bolt and screw construction and fully weatherized for long unit life. Units are available unpainted galvanized or painted finish. 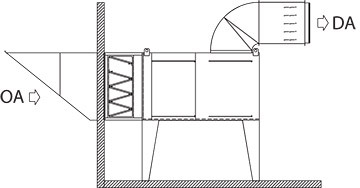 What is a direct-fired air handler? A direct-fired air handler is a piece of equipment that heats air directly by passing it over an open flame burner within a cabinet. As outside air enters the heater inlet, the colder air absorbs the warmer air as it travels across the heat source. Warm air is delivered into the space with the assistance of a large blower housed within the cabinet, located opposite the burner section. Bananza direct fired air handlers include several standard safety features. 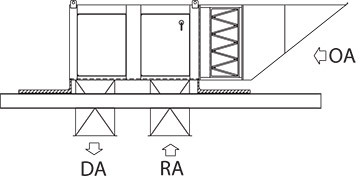 A fused rotary disconnect forces a safe power shut-off to occur before new replacement parts are installed or annual maintenance and service occurs. The high temperature limit switch located on the blower housing (alternatively inside the control enclosure) shuts the air handler off if discharge temperature exceeds setpoint. Additional control options such as Carbon Monoxide or Carbon Dioxide Detectors monitor appropriate levels of contaminants for additional safety measures.